It’s cold outside today, so the title of this post may not produce the content you were expecting (although my ego appreciates that you started reading under that pretence. even if you didn’t). Instead we’re talking about cupboards – much more exciting, I’m sure you will agree. This month for Random Recipes Dom has set the challenge of showing the world what is in our cupboards; daring us to bare all and show the world what’s behind those doors. I’m insatiably nosy, so I’m keen for some cyber-snooping this month (I’m expecting the NSA or GCHQ to be heading hunting me any day now), so it is the perfect challenge for me. Who doesn’t like to a little snooping now and again? 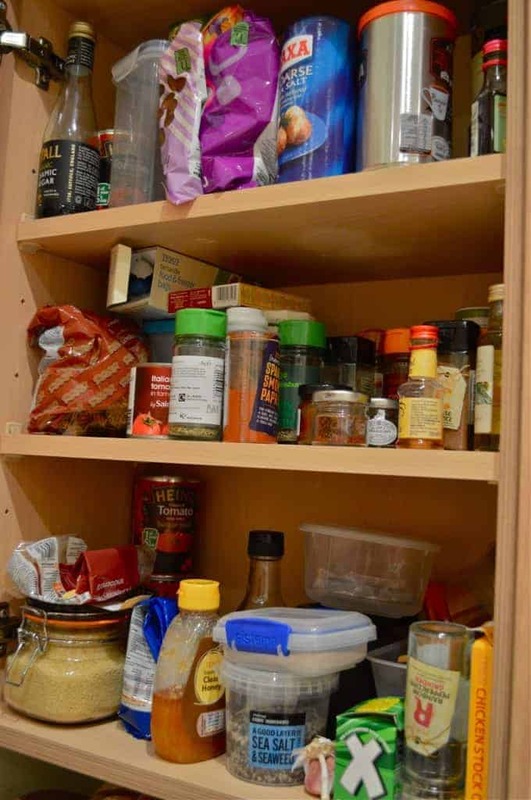 There are also a selection of boxes and packages lining the tops of the kitchen cupboards, but since they are an even bigger and more disorganised mess I think we can agree that they are just a figment of my imagination. It wouldn’t be a true look at my cupboards though if I didn’t include the picture below. 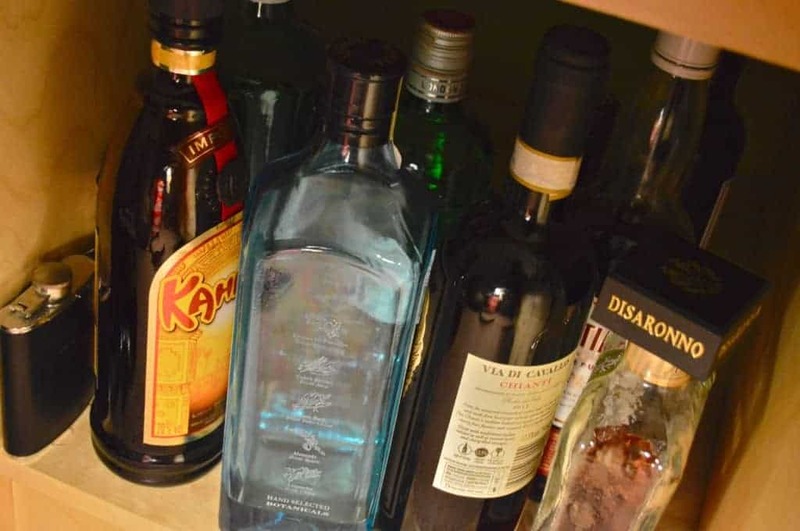 My Alcohol cabinet – I’m yet to find a suitable globe store for them, but I live in hope – is a regular feature on The Usual Saucepans, so it seems only fair that it gets an mention. It’s growing arms and legs at the moment though (the case of wine I accidentally-on-purpose the other day doesn’t fit and some bottles are too tall), but I cannot see any reason why this is anything but a good thing. As previously mentioned, I’m feeling quite nosy so I’d encourage everyone to take part in this challenge! If you liked this post why not follow The Usual Saucepans on Facebook – get all the action as it happens and some food chat in between! It’s Not Christmas without the Cake! No camera at present, thankfully for my dignity. My cupboards have several inexplicable bags of out-of-date flour in them since I can’t figure out what to do with it other than, I don’t know, plastering the inside of a mud hut or something. How the cupboards, which are at head height, stay on the wall with all that heavy stuff inside I don’t know. 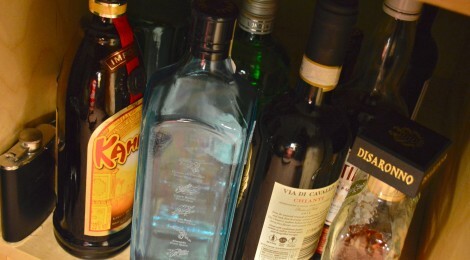 My alcohol collection looks a lot like yours. I am also lacking a drinks cabinet. My problem seems to be that I want it to be small enough to not clutter the place up but big enough that it’ll take more than about 3 big bottles. Maybe I should go tall with it, seeing as I’ve got a typical Edinburgh useless high ceiling. Carpentry may have to happen. I seem to have accumulated a lot of flour lately, not really sure how. Well, you never know when you’ll need to plaster the inside of a mud hut – best be prepared! It’s an issue in a lot of Edinburgh houses – only problem is that then you won’t be able to reach the top bottles. Let me know how you get on – definitely need to do something with my collection. Quaked may have been a bit dramatic, they aren’t really that bad! Don’t worry about BWS, I’m not expecting you to buy/eat things you’re not a fan of. Have a good Christmas! Ha ha, no, not just now (don’t think the world is quite ready for that!) I do love being a little nosy – and I suspect you are too, which might have had a slight bearing on the challenge’s theme? Well, I say that there’s nothing wrong with that what-so-ever. A bit of a mess, yes, but I prefer ‘organised chaos’. Merry Christmas! Ha ha! It’s a little too cold for that today, sorry 😉 Thank you! Organised chaos is definitely the way forward! Merry Christmas. I just enjoy how everyone has a totally different definition of ‘tidy cupboards’. Oh, a reorganisation of the chaos is on my to do list too, can be a race between us to see who doesn’t do it first! I think messy cupboards make it more interesting. Well, that’s how I justified my laziness. Thanks for stopping by.